While title celebrations on the blue side of Glasgow have been hogging the Scottish headlines this week, the Blue Toon 180 miles further north has been quietly engulfed in a football fever of its own. It is the backdrop to the final of a Cinderella cup that has been thrust into unusual prominence - and moved from more humble venues normally chosen - because of the presence of a Rangers support that is expected to ensure a 52,000 sell-out at the national stadium. The Ibrox club are fresh from clinching the Championship title to complete a four-year journey to the top flight that began in Scotland's fourth tier following liquidation. 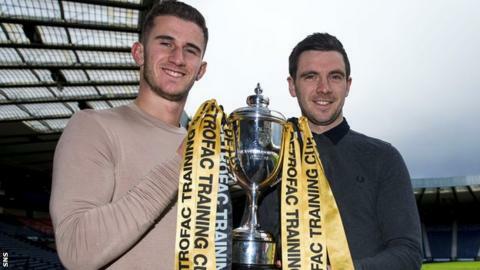 Now they will be expecting another day of glory as they attempt to win the Petrofac Training Cup, the most recent incarnation of the Challenge Cup, for the first time in four attempts. Standing in their way are unfashionable Peterhead, who are themselves looking to round off what is already the most successful season in their history by winning their first national trophy. Peterhead's population of 18,500 situated 32 miles north of Aberdeen has only been represented in Scotland's senior leagues since 2000, when they and Highland League rivals Elgin City won a ballot among member clubs. The Blue Toon, whose home is the 3,000-capacity Balmoor Stadium, presently sit second in League One and defender Ryan Strachan has taken inspiration from club chairman Roger Morrison's suggestion that they could be "the new Ross County". County, from the even smaller northerly outpost of Dingwall, have themselves taken that journey from the Highland League to Scotland's top flight, winning the Challenge Cup twice on the way and last month lifting the Scottish League Cup by beating Hibernian. "It is hitting home now that we're the highest-placed Peterhead team ever," Strachan told BBC Scotland. "It is also hitting home that we could win a major trophy and we could be a Championship side next season. You just never know. "It is a great club to be at and very exciting times." Rangers will be heavy favourites to retain hopes of a trophy treble - they also face city rivals Celtic in the semi-finals of the Scottish Cup - especially as they have only lost one of their last 19 matches. However, Strachan stresses that the team who have been managed by 52-year-old former Dundee United and Scotland midfielder Jim McInally since 2011 had themselves gone 16 games without defeat until their last two against relegation candidates Cowdenbeath and Forfar Athletic. "We've got a good side, a good manager and we get on well as a group," he said. "I don't think it's a shock we've done so well as we've got the best squad in the league." That is some claim considering they lie 16 points behind Dunfermline Athletic, but Peterhead's two recent defeats only came after it became clear that the Pars were going to be league champions and McInally's side were left looking to the play-offs to retain their hopes of promotion. "We've been on a great run the last four months," said 25-year-old Strachan. "You could even say since the semi-final. "We definitely go into this game with high confidence, we are a young team and we believe we can beat anybody." For that belief to manifest itself in a triumphant finale to the Petrofac Training Cup, which is open to clubs outside the top flight, Peterhead will have to overcome a side that eased them out of the League Cup 3-0 at Ibrox in August. However, Sunday's game arrives close to the two-year anniversary of perhaps the Blue Toon's finest moment - a 2-1 win in Glasgow as Rangers were heading for the fourth-tier title that Peterhead matched the following season. Rory McAllister's goal sealed that famous victory and the striker remains Peterhead's most potent goal threat, having found the net an impressive 38 times in 31 appearances this season. "We've played down at Ibrox three times, so we are used to playing in front of big crowds there and we've just got to savour the occasion at Hampden because days like that don't come along too often," said the 28-year-old striker. Rangers manager Mark Warburton has been able to recruit the likes of former Wigan defenders Rob Kiernan and James Tavernier and players on loan from Arsenal and Tottenham to supplement a highly-paid squad already blessed with some Scotland caps. Counterpart McInally, meanwhile, has had to rely on attracting north to the little fishing port part-time journeymen who will assemble on Saturday after finishing their week's work with various other employers and having missed the cup fever enveloping the town. "Most of the guys stay in Aberdeen," said McAllister. "Nobody stays in Peterhead anymore and you only see it on Facebook and Twitter. "We are scattered all over Scotland - a few guys in Aberdeen, Edinburgh, Glasgow, Dundee, so we will be picking people up all down the road on the team bus." McAllister, though, says anticipation among the players has been heightened by the long wait since their 2-1 semi-final win over Queen's Park in November. "I've never experienced it before, so you've just got to enjoy it because it is probably the last chance our guys will have to do that at a full house at Hampden," he added. "Once we guaranteed our play-off spot, we took our eye of the ball a little bit and maybe not played as well as we had been, but it is only natural with a big game coming up. "I think you've got to turn up and believe to a certain extent you can win or there's no point in turning up. "We just have to hope that Rangers are not at the top of their game and we are."